In their glorious garden setting, these modest rooms both contain a double bed and 2 single bunk beds. 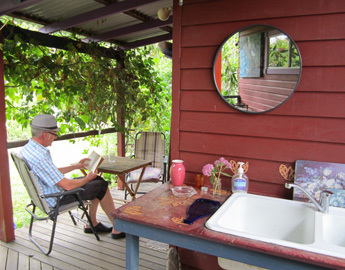 They share a colourful common verandah which has a double sink, fridge, gas stove and sitting area. They both share the ‘bath house,’ 25m away. Cute, cosy and affordable! Kids of all ages love them. The cubby cabins are on your left as you come up the driveway. From there, follow the pathway – past the winter breakfast sitting area – to the back verandah of the main house. Keep going past the outside kitchen to the purple door which is the shared bathroom with a second toilet around the corner. COST – $100 - per night per double. $20 per extra person.